Grandma has a doctor’s appointment next Thursday, and your brother John has agreed to take her. He’s never taken Grandma to the doctor’s before, so he’ll need to know -- in addition to the date and time -- where it is, special instructions for taking Grandma out of the house, and what things to ask Grandma’s doctor. CareTogether and the mobile version of CareTogether have the tools to help everyone help John on this Grandma Adventure. 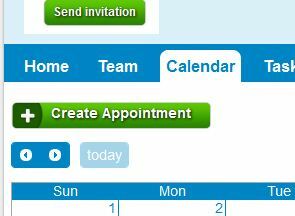 Scheduling Grandma’s visit to the doctor As you enter the date and time of the appointment in Grandma’s Page’s CareTogether calendar, be sure to assign the appointment to John. When you save the appointment in CareTogether, he’ll get an email with the appointment details. Be sure to put the clinic’s address in the “Location” field. The description is a great place to put the doctor’s name, the clinic’s phone number, as well as any special instructions for getting Grandma to and from the clinic as safely as possible. Creating and assigning a task list for Grandma’s doctor visit After you schedule the appointment in the calendar and assigned it to John, it’s time to provide him with either a list of things to take with him or questions to remember to ask. 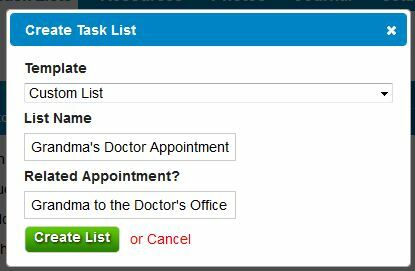 Using CareTogether’s “Tasks” features, your team can create a task list called “Grandma’s visit” and each of you can add important things for John to remember on his trip. When you’ve completed the list, email the list to John so he has it with him when he goes to the doctor. Or, if he has a Smartphone, John can pull up the task list from the mobile version of CareTogether! Sharing notes from Grandma’s doctor visit While John’s at the clinic with Grandma, he can share updates with the Care Team by using the mobile version of CareTogether. After John delivers Grandma home safely, he can inform the whole care team about the details of the trip by posting a Journal. Other team members can post comments and questions on his updates and journal entry. This is an important step because as team members post journal entries after visits with Grandma, you develop a comprehensive record of her condition and how she handles trips to the doctor’s office, grocery store, birthday parties, and more! So there you go! You’ve successfully helped John help Grandma have a safe and informative trip to the doctor’s office by using CareTogether. Congrats!